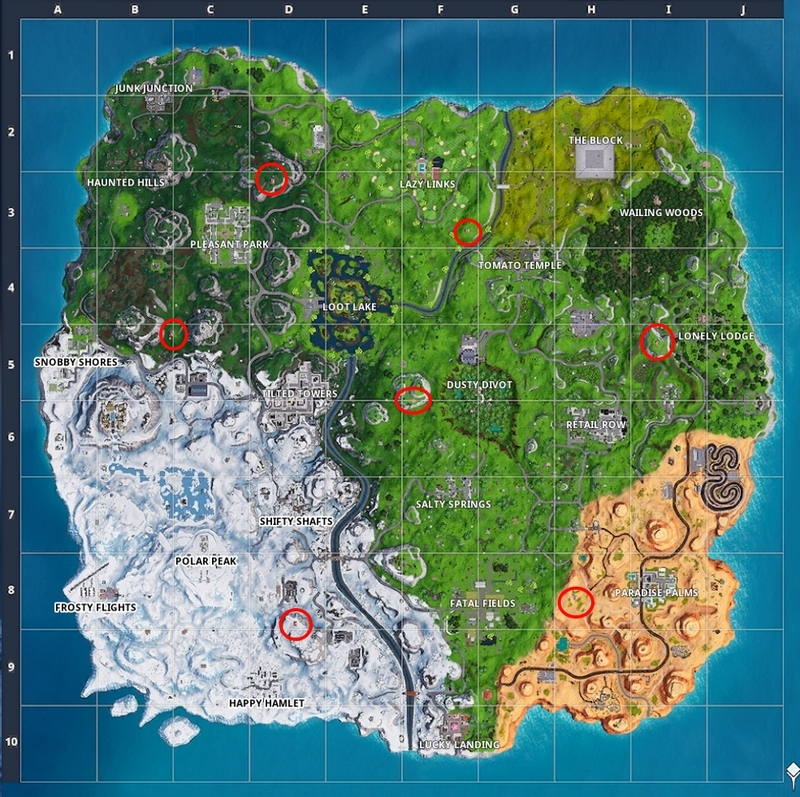 How to find all Expedition Outpost locations in Fortnite for this Season 7 Week 7 Challenge. If you want to bag all of your Battle Stars this week, then you're going to need to complete the Week 7 Season 7 challenge that tasks you with visiting seven Expedition Outposts. These are located all over the Fortnite map, but the good news is that they're pretty easy to find. They're big, bright red buildings and pretty clearly visible on the map - a welcome change to the usual busywork of these challenges. Although they're easy to see, if you're not very familiar with Fortnite's map then tracking them down might take you a little bit longer. So that you can get this challenge finished quickly, we've put together a guide to finding all seven Expedition Outputs. To make things even easier, we've embedded a video by well-known Fortnite content creator HarryNinetyFour. After that we've got a quick text breakdown of where to head if you can't watch video right now. Finally, we've also got a map which shows the exact location of each Expedition Outpost. All told this should give you no excuse for not getting this challenge finished fast! We’ve linked HarryNinetyFour’s video below which shows you all of their locations. If you find it helpful, do make sure to give it a thumbs up and consider subscribing. He’s easily one of the best Fortnite YouTubers out there for Weekly Challenge related stuff! Pleasant Park - On the hill northeast of Pleasant Park. Snobby Shores -Northeast of Snobby Shores, tucked right in between the two large mountains. Polar Peak - Directly south of Shifty Shafts and east of Polar Peak. It’s on a large hill near taco stop. Paradise Palms - West of central Paradise Palms, and directly east of Fatal Fields. It’s sandwiched between these two locations and surrounded by palm trees. Lazy Links - South east of Lazy Links, near the river.